Prior to the First ITER Council Meeting, the Science and Technology Advisory Committee (STAC) and the Management Advisory Committee (MAC) to the Council met in Cadarache to review the latest activities by the ITER Organization. 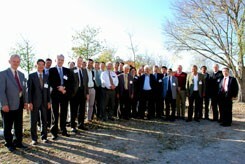 The MAC recognized the substantial progress that was made since the last meeting: "The ITER Organization has begun to put in place the elements of project management necessary to carry out its tasks, including a well-defined hierarchy of technical and governance documents, the appropriate configuration management, and tools necessary to accurately measure progress in terms of earned value systems. Although this work is not complete, MAC is encouraged by the vision and the progress made by the ITER Organization." "The overall ITER design is sound," was the outcome of the STAC. In their final report, the STAC members - fusion experts from around the world - concluded that the ITER Design Review had been "extremely useful," and that it had given "excellent results in solving an important number of issues on which there is now a general consensus." Thus the STAC supported most of the Design Change Requests (DCRs) that have resulted from the recent Design Review although it was emphasized that the 2007 Baseline Design was not yet complete, as there are many DCRs still in formulation or under study.